Rachel's improv career began as a freshman in college where she spent Friday nights playing Follow the Follower until campus security was called. She's just as willing today to break the silence with some improvised sounds and movement. Rachel has taken improv classes at the Magnet Theater and Sea Tea Improv going back and forth between NYC and Hartford, CT. 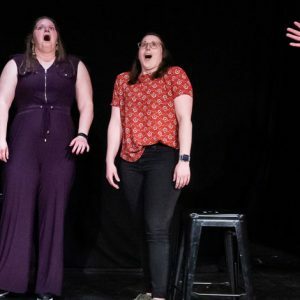 Highlights include performing with Hot Garbage at the 2015 Hartford Improv Festival and for We Might Just Kiss: A Female Improv Event at the Magnet Theater. Now living in DC, Rachel is happy to have found WIT! When she’s not doing improv, she spends her time watching Netflix or looking for NY/New Haven style pizza in the DMV.